Search for and photograph endemic birds of the Lesser Sundas. Look for endemic night birds such as Mee’s Nightjar and Little Sumba Boobook. Climb Lake Kelimutu and see the famous three-coloured lakes; see the spiderweb rice fields of Cancar. Experience the Beta traditional village in the forest highlands. Visit remote Sumba Island with its own local endemic birds. The island of Flores is almost tourist-free and this has proved a challenge to birders trying to reach the area in the past. It lies in the Lesser Sunda islands which are east of the Wallace line and are more arid than many other parts of Indonesia. They have a number of sought-after endemic species. This tour visits Komodo, Flores and Sumba, which together support all the local island endemics and a variety of species endemic to the Lesser Sundas as a whole. 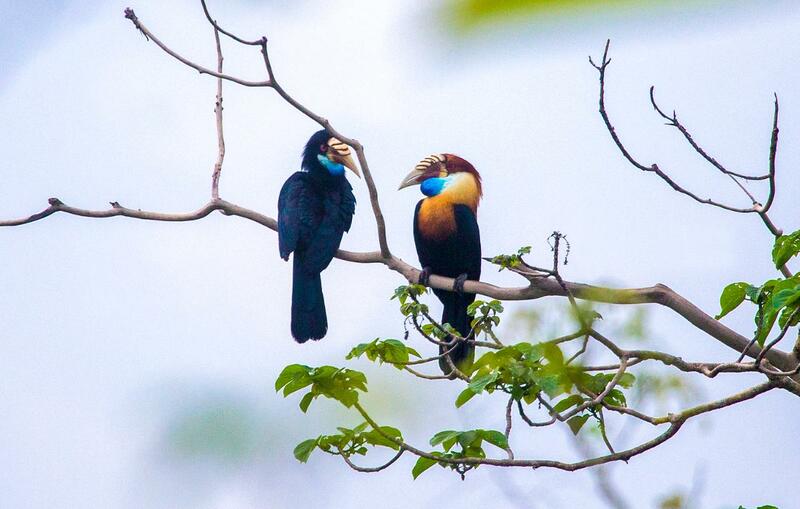 This exciting tour gives you the chance to travel accompanied by local bird guides to remote areas as well as experiencing some of the other wildlife (e.g. Komodo Dragons) and culture of this fascinating area ... which is also very accessible from Australia. Day 1 Arrival at Ngurah Rai Airport, Denpasar. Transfer to hotel. Dinner, own expense. Day 2 (B, L, D) On arrival at Komodo Airport-Labuan Bajo, you will picked up by guide and driver then go directly to the pier. Cross by boat to Komodo island. Night birding in Loh Liang – Komodo. Dinner and overnight on the boat. Day 3: (B, L, D) Komodo – Manta Point - Labuan Bajo. Morning trekking and birding in Komodo to search for Komodo Dragons, Orange footed-Scrubfowl, Green Junglefowl, Yellow-crested Cockatoo, Black-naped Oriole, Green Imperial Pigeon, Black-naped Monarch, and more. Afterwards, back to the boat and cross to Pink Beach for swimming and snorkeling. Picnic lunch and then continue to Manta Point to try to swim with Mantas. Afternoon Boating back to Labuan Bajo, check-in into hotel. Day 4 (B, L, D) Labuan Bajo – Puar Lolo – Ruteng. Depart early morning (05.30 AM) drive to Puarlolo for morning birding to look for Flores Monarch, Red-Cheeked Parrot, Crested White-eye, Cream-browed white-eye, and many more. Birding will finish at 11.00 AM, then drive for 1 hour to Lembor. Lunch at local restaurant in Lembor. After lunch, drive to Nte’er to look for Flores Lorikeet then drive to Ruteng with short stop at Spiderweb Rice fields. Check-in to hotel. Night birding to look for Wallace’s Scops-Owl. Day 5 (B, L, D) Ranamese – Liang Bua – Ruteng Pu’u. Morning birding at Ranamese forest for Flores Scops-Owl, Bare-throated Whistler, Russet caped Tesia, Brown-capped Fantail, Wallace’s Scops-Owl, and more. Back to Ruteng for Lunch. Drive to Liang Bua (Hobbit cave) and in the afternoon visit Ruteng Pu’u Village. Day 6 (B, L, D) Golo Lusang – Kisol. Morning birding at Golo Lusang till 11.00 AM. Back to the town for lunch before drive to Borong. Check in to simple hotel in Borong. Afternoon birding in Kisol to look for Flores crow, Flores Green Pigeon, Black-napped Fruit Dove, Wallace’s Scops-Owl etc. Day 7 (B, L, D) Borong – Kisol – Bajawa – Ende. Departure early morning and drive for 30 minutes to Kisol for morning birding with same targets till 10.00 AM. Drive directly to Bajawa for Lunch. Continue driven to Ende. Day 8 (B, L, D) Ende – Tambolaka – Lewa. Morning flight from Ende to Tambolaka airport in Sumba. Breakfast at restaurant next to the airport. Explore Tana Daru, Drive to Waingapu and check in to Hotel. Day 9 (B, L, D) Waingapu – Billa - Waingapu. Very early morning at 04:00am drive to Billa in Tabundung subdistrict. Breakfast at local house in Tabundung, and enter the National Park in Billa. Lunch with a local family. Afternoon drive back to Waingapu. Billa village – Tabundung subdistrict located in south Sumba, this place can get by car from Waingapu for about 2.5 hours, one of new birding area in Sumba, the best place to see many endemic birds ie: Nusa Tenggara flycatcher paradise, Nusa Tenggara Golden Whistler, Sumba Hornbill, pigeons and parrots, including Orange-crested Cockatoo, the beautiful Red-naped Fruit-dove, Sumba Green-Pigeon, Cinnamon-banded Kingfisher, Elegant Pitta, Sumba Jungle Flycatcher, Sumba Brown Flycatcher, Chestnut-backed Thrush, Arafura Fantail, Rusty-breasted Whistler (split from Common Golden Whistler), Pale-shouldered Cicadabird, Yellow-spectacled and Ashy-bellied White-eyes, Sumba Myzomela, Apricot-breasted Sunbird, Blood-breasted (Sumba) Flowerpecker and Lesser Wallacean Drongo. Day 10 (B, L, D) Waikabubak. Cultural tour to visit Pau and Rende and relaxing at kalala beach, afternoon back to the hotel. Day 11 (B): Waikabubak – Bali. Transfer to the airport for the flight to Bali. FLORES – endemics - Flores Lorikeet Trichoglossus weberi, Wallace’s Hanging Parrot Loriculus pusillus, Flores Scops Owl Otus alfredi, Flores Crow Corvus florensis, Flores Monarch Monarcha sacerdotum.